Potsdam, the regional capital of (state) Brandenburg, is like an island surrounded by the river Havel, canals and lakes. The town is extremely interesting, not least because of its proximity to Berlin and its colourful history, which stretches back 1,000 years and is reflected in famous palaces and museums such as Sanssouci Palace, Belvedere Palace and Charlottenhof Palace . The former summer palace of Frederick the Great, Sanssouci Palace and the surrounding park with its numerous attractions are not the only the places worth a visit. The town‘s historical districts – the Russian colony of Alexandrowka, the Dutch quarter and the former Bohemian weavers‘ quarter – also give an insight into the special atmosphere of this charming town. It is simply the place for anyone with an interest in the past. No other palace has such close links to Frederick the Great as Sanssouci. This legendary building is regarded as a masterpiece of the Frederician rococo style. King Friedrich II wanted a place where he could spend some time „sans souci“ (without a care). Based on sketches and designs by G. W. von Knobelsdorff, the palace was built between 1745 and 1747 overlooking the famous vineyard terraces. The attachment that Friedrich II felt for Sanssouci Palace was also demonstrated by his desire to be buried in a vault beneath the highest vineyard. 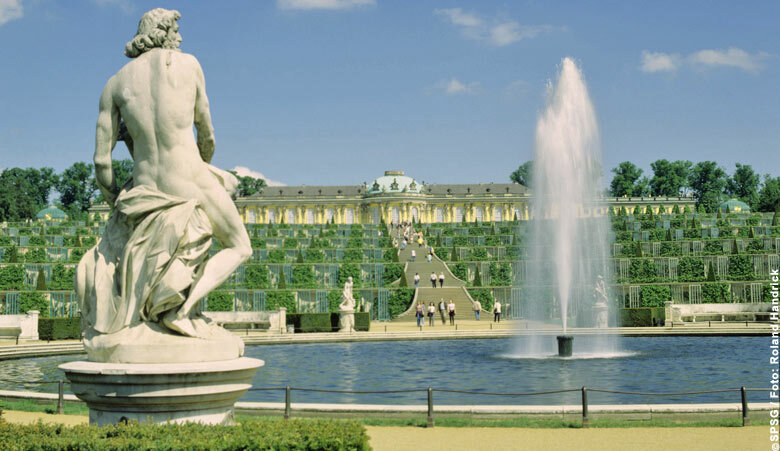 Various guided tours of the palaces are available all year round in Potsdam.